Dungeons are treacherous labyrinths below the surface of Godville filled with treasure, traps, boss-monsters, and adventure. Only Gods with a temple may send their hero (at the cost of 50% of their godpower) into these places of peril and reward. It is beneath the surface of the world of Godville, beneath the layers of treasure (not to be confused with the lairs of boss-monsters) lies the underworld, where those who have died wait for resurrection and revenge. A long time ago, the various demons in the underworld built the Dungeons to keep heroes in for eternity after they had died. However, the heroes seemed to keep escaping them as their gods had found a button on their remote control that created a tunnel between the Dungeons and the world above, which the heroes would use to escape. Eventually the demons of the underworld had had enough and in a rage they destroyed that particular button, to prevent the heroes from escaping, only to find that they barely had enough time to lock the heroes in the dungeons before they were resurrected. As a result the dungeons were no longer used, and fell into disrepair. Eventually the admins of Godville repaired the button and since then, gods have been able to create tunnels into the underworld so their heroes can retrieve the treasure left there by fallen heroes. Dungeon-dwelling creatures were quite unhappy about their hard-earned treasures being taken away bit by bit by the intruding heroes and heroines. So, after much planning, the Boss-Monsters decided to spice up the dungeon-exploring experience by introducing new features. On Day 1303 g.e., the gods & goddesses of Godville were advised of these new battle ground conditions by the Godville admins. Everything in these are quite straight-forward. The party takes a step per turn, all unexplored rooms are indicated along with blocked passages and special rooms are hidden here and there. At least 3 Bosses of varying levels are hidden all over with bosses a higher level (indicated by the number of abilities it has) closer to the treasure trove. Anti-influence "Magic and influences don’t work in this place because of a spell." Blocks gods' influences while traveling, but can still direct. The influences still work during boss battles. Clarity "Bright light illuminates interesting places on the map." Special rooms are indicated by a (!) when in proximity. Hoarding "Most of the gold from the treasury is in the pockets of greedy bosses." Bosses have more gold. The treasury has less. Hotness "All treasure hints in this dungeon play “Hot and Cold." All hints are hotness hints. Hurry "In this dungeon heroes have 50 steps until evacuation instead of 100" Party has to find treasure within 50 steps. Jumping "Anomalous gravity sometimes makes heroes jump over the squares." The party will skip rooms. Migration "Stronger bosses are not always near the treasure." Boss-monsters will spawn randomly, instead of having the strongest monsters closer to the treasure hoard. Mystery "This dungeon is special, but nobody knows how." It can be any type of the special dungeons. Pledge "Everyone pledged one log of wood for a promise to leave the dungeon through the treasury." Every hero loses a log upon entering the dungeon. Rejuvenation "The air here is alive and all healing." The heroes will receive healing of 5-6 hp in every room. Robbery "Everyone has to donate all their gold into the treasury's fund for fair redistribution later." All coins are lost upon entering. The treasury will have the amount of coins that the heroes had upon entering added to the usual amount. Savings "After finding the treasure all heroes' gold will be automatically deposited into Savings" When the heroes reach the treasury all coins will be deposited into savings, leaving them with none. Solitude "All bosses have left, leaving traps instead." 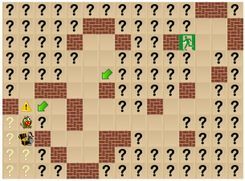 A dungeon without bosses but with many traps. Surprise "Weak, but quiet bosses tend to appear out of nowhere and attack all of a sudden." No warnings will be given when the heroes are near a boss-monster. However, bosses are weaker. Toxicity "Toxic gas in the passages undermines health of explorers." The heroes will receive damage of 5-6 hp in every room. Uncertainty "All hints to the treasury are double-minded." All hints are double minded hints. Woodness "This dungeon has double amount of wood in the treasury." You will receive 2 logs. 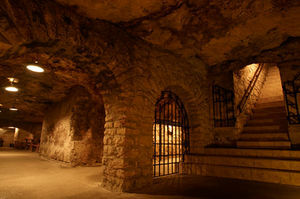 The main aim of entering a dungeon is to find the treasure room, where there is gold, loot, and gopher wood, which the heroes will take before returning to the surface. If the hero has gotten fewer than two gopher logs from dungeons within the last 24 hours, they are guaranteed to find a log in the treasure room. If they have found two or more, then it is up to the great random. If only one hero is left, he will drag his team mates to the surface without looking back (two heroes must remain conscious at all times). If the heroes wander through 100 passages without finding the treasury, they will become bored and give up. Heroes may leave through the Exit they came in through (only if at least 20 steps have already been taken). It's guaranteed upon pressing the "Send to Dungeon" button. If you hero/heroine fails to enter a dungeon, this gain will be his/hers to keep. The gift is about 33% (rounded down to the nearest integer) of your health capacity. For example, if your max health is 360hp, then 120hp will be added at the time of the remote activation. What if your health is 392hp? Then the increase will be 130hp, rounded down from 130.67. To maximize on this bonus, make sure your hero's health is 67% of your max health, rounded UP! Regeneration of some godpower to compensate the 50% required to attempt entry into a dungeon. A gain in gold for none of the work. The word around milestone 404 is that this gold comes from some of the heroes bringing back treasure from a successful run in the caves. The waiting time before reattempting to send the hero/heroine to the dungeon is reduced from 4 hours to 1 single hour! Perhaps there are other yet unknown/undocumented bonuses? Encourage: Your hero will gain health, all conscious party members will gain some health, or nothing will happen. Punish: Your hero/group will lose health or nothing will happen. Avoid using this. Miracle: Full healing for caster or partial healing for group. Caster might also receive an item. North: The heroes will move to the room above them on the map. South: The heroes will move to the room below them on the map. East: The heroes will move to the room to their right on the map. West: The heroes will move to the room to their left on the map. It is not possible to move diagonally. Aside from directional commands, no other voice commands will work while exploring the dungeon. While the party is exploring the dungeon, methods to heal your hero or heroine are limited. Encourages and miracles can be used to directly heal your hero or heroine, as per information above. The party may stumble upon bonus rooms that heal one or all conscious adventurers by some amount. In a Dungeon of Healing, all conscious party members will be healed by small amounts at every step. Healing artifacts carried into the dungeon won't be used at any time. At worst, traps may cause your hero or heroine to lose these items. Voice commands to heal while exploring the dungeon will not work at all. Boss-monster duels can offer the opportunity to heal. Encourages during exploration are much less effective than encourages during a duel; 'heal' godvoice commands can be effective during duels as well (though, just like in the arena, an aura of audibility will have no effect during boss-monster combat). As ever, be attentive to a boss-monster's abilities; overhearing, leeching, or explosive boss-monsters in particular require more attention to healing strategies. If, during a boss-monster duel or from the effects of a trap room, your hero's health drops to 1hp, they will be knocked unconscious. They will no longer be able to contribute to combat, though their max HP will still contribute to the strength of any boss-monsters encountered by the party. They will not take a full share of loot, nor will any influences or bonus rooms have any effect. The only method by which unconscious explorers can be revived is in the event that the surviving party members steer the group into a nook that revives all unconscious heroes. At least two heroes must be conscious for the party to continue; if less than two explorers remain conscious, the party will be rescued and fined gold and artifacts for their failure. Your hero will never die as the result of an adventure in the dungeon. @ Heroes Once the heroes have entered the room it will become an explored room.
? Unexplored room May contain various things as described below, should be avoided on low health. Explored room Will produce the same entry every time it is entered, for one off events it will be replaced with a neutral room entry if entered a second time. 🚪 Exit Your heroes appear in this room. Landing on it after the twentieth step ends your adventure. 💀 Beaten boss monster After a boss is beaten, this symbol appears in the square of the fight. ~ Triggered mole hole A mole hole will send the heroes to a random room, they can't be avoided and only get activated once. After a mole hole is triggered, this symbol will show up. ⚠️ Boss warning A boss monster might be in this square. ↑ Hint room Can also appear as ↗, →, ↘, ↓, ↙, ←, and ↖ depending on the location of treasure. Can also appear as ⌊, <, ⌈, ∧, ⌉, > or ⌋ depending on the location of the treasure. These hints can occur in any kind of dungeon. They are the only kind of treasure location hint given in a dungeon of Uncertainty. More info below. ✵ Hotness dungeon hint Hot and cold hints show up as ✵ Freezing/Very Cold → ❄ Cold → ☁ Mild → ♨ Warm → ☀ Hot → ✺ Burning/Very Hot. These symbols don't point to any direction but indicate how close you are towards the treasure. The closer you are the hotter it gets. They are the only kind of treasure hint given in a dungeon of Hotness.
! Special room Seen in dungeons of Clarity, where nearby unexplored special rooms are indicated with this symbol. Only illuminates 1 room in each direction. Once the party moves on, the room returns to the "?" symbol. Once explored, these rooms will become regular explored rooms. You will find things like artifacts, gold, traps, etc. Pets with a dungeon ability will also cause these marks to appear on the map. Again, they mark any kind of special room, but unlike Clarity dungeons the mark can appear at any distance and never disappears until the room is explored. ✖ Nook May do one of any number of things. The first entry in the Dungeon Log describes the nook and its reward in bold text (for example, "A decaying map on a wall reveals a nook with the reward: dungeon will change its type."). When it's a mystery nook, its behaviour is revealed only if you enter it. Occasionally, it will be necessary to enter the nook in order to complete the dungeon. 🔒 Locked treasury This symbol will appear on the map if the party discovers the treasury before visiting a nook that unlocks the treasury. A bold-text message in step 1 of the Dungeon Log will warn if a nook visit is required to unlock the treasury. | Secret Stash Seen in dungeons with a nook with the following message, "A decaying map on a wall tips off about a nook with a reward: all traps will turn into secret stashes... or vice versa." After hitting the nook, a message like this will appear, "After tossing a big coin in the nook the happy adventurers realize that all traps in this dungeon have turned into secret stashes" and then some rooms will turn into the | symbol. Avoiding boss-monsters helps to speed up a dungeon, reduce charges spent, and make for a happier hero. Often times, a boss-monster can be avoided if a god takes the time to isolate the boss-monster's location. In the example to the right, the heroes start in cell D2, they move west to C2, then west again to cell B2 where they receive a boss-monster hint. The boss-monster hint seen in cell B2 means that a boss-monster could be in any of the three cells touching cell B2; cells B1, A2, or B3 (as noted by the red circles). Instead of guessing where the boss-monster could be located, an experienced driver will backtrack east to cell C2. Next, the driver will give a north command to cell C1. If cell C1 gives a boss-monster hint, the driver will know that a boss-monster is in cell B1. Conversely, if cell C1 does not give a boss-monster hint, the driver will know that cell B1 does not have a boss-monster. The driver can then make an effort to avoid the boss-monster. Naturally, walls may prevent gods from using this strategy or may prevent heroes from being able to walk around a boss. The heroes will wander the dungeon by themselves, but will also listen to the instructions of their gods, who generally have a better sense of direction. Rooms can significantly affect the direction of the expedition as well as the outcome of the treasure hunt as they have several effects. Listed below are descriptions of each type of room and their effects. The dungeons mostly consist of these rooms, even though it may feel like there are more Trap Rooms than anything else in certain dungeons. Entering these rooms has no apparent effect, other than providing entertainment for the Gods and Goddesses. Now and then, the dungeon party may enter a special room with either positive, negative or both outcomes for a single member or all. The effects and results of these rooms are detailed below. These rooms provide increases in godpower, gold, health, and loot. Some exist only once and generally provide higher gains while others may be used repeatedly but provide less gain. But, most of these rooms appear only once. The heroes pray to give their gods some godpower (one off). Increase ranges from 3% GP to 50% GP. All members of the party receive gold (sometime a single member finds it and shares it with the party). The gain is usually between 1000 - 2000 gold coins. This becomes less when shared. A single member of the party gains significant health (one off). Gain is between 50-150 (scaled according to level). All heroes find something that heals them (one off or can be reused). Gain is between 15-30 (scaled according to level). One member of the party finds an artifact (one off). All heroes get some loot (one off). In each of these circumstances, each hero/heroine receives a single artifact, except the treasure room. These rooms can come in quite handy in leading the party through the maze of the dungeon layout. The heroes find a clue as to what direction they should search in. The first clue can be expected to be found in the first 25 steps, but this is not guaranteed. NOTE: These clues point in the direction of the treasure, but not necessarily the direction you should go, see diagram. They also are not necessarily the exact direction. For example, a hint pointing north may have the treasure mainly north, and slightly west. More specifically, a treasure found 5 rooms south and 1 room east can be indicated by a south-east arrow rather than a south arrow. This becomes a southward arrow if the treasure is located 6 rooms south and 1 room east. This implies that diagonal arrows (i.e. : NE, NW, SE, SW) have a limit of a 5:1 ratio before they become straight arrows (i.e. : N, S, E, W). If the "?" contains the treasury, a clue given at the heroes' previous location (to the north) would point south. Except for Migration and Solitude dungeons, the treasure will be located in one of the eight rooms adjacent to the treasure boss (the boss-monster with three abilities). This is a sign that a boss is hiding in an adjacent room (any unexplored room adjacent to the room where the hint is given is the possible location of the boss-monster). This clue will be a subtle phrase in the description of the room such as "something big and heavy is walking nearby". A list of known boss hints is available here. There is no marking on the map for it. These rooms reduce health, gold and loot. But godpower may also be indirectly compromised in trying to keep the heroes alive/conscious. Unlike bonus rooms, these rooms' effects are all ongoing. Gold coins get taken away from one or all members of the party. The loss is usually between 500 - 1500 gold coins. One member of the party drops an artifact. All heroes drop some loot. In each of these circumstances, each hero/heroine loses a single artifact. A single member of the party loses significant health. Loss is between 55-150 (scaled according to level). All heroes find something that harms them slightly. Loss is between 14-55 (scaled according to level). Some dungeons will have a nook, which will be marked on the map by an ✖ when the adventurers drop into the dungeon. The nook, if present, may do one of any number of things. The first entry in the Dungeon Log describes the nook and its reward in bold text (for example, "A decaying map on a wall reveals a nook with the reward: dungeon will change its type."). When it's a mystery nook, its behaviour is revealed only if you enter it. Occasionally, it will be necessary to enter the nook in order to unlock the treasury. Some special rooms have characteristics of bonus rooms and trap rooms. The only observed example of such a room is when a single member of the party receives a significant amount of gold but this is accompanied by sustaining some health damage at the same time. A boss-monster will force the heroes to fight them in a duel. As per usual duel conditions, heroes may lose health, gold, and/or artifacts. Occasionally, heroes may come out on top. For instance, meeting and easily defeating an Enlightened boss-monster may leave the heroes with more godpower than what they entered with. The heroes find the treasury. The multiple rewards include: gold, loot, and possibly a log of gopher wood). The numbers in gains vary and the possibility of obtaining a log is explained further below. Dungeon will start with notification of the side quest: The Freeshooters Association offers a prize for hunting down all bosses: a chance to find an extra gopher wood log. Depending on the number of heroes in the party, there may be four or five bosses in a dungeon. The dungeon chronicle announces when you've completed the quest: A pleasant voice from above announced that all bosses in this dungeon have perished and wished the intruders to burn in hell. Dungeon will start with notification of the side quest: The Bureau of Promises pledges a chance to find an extra log of gopher wood if the whole team or exactly two of the members find the treasure. Dungeon will end with notification of the side quest: A pleasant voice from above thanked the adventurers for finding the treasure with the required number of heroes. Dungeon will start with notification of the side quest (example needed). If the treasury is found within 40 steps, conscious party members will gain an extra log for the ark. The https://www.godalert.info/Dungeons/index-eng.cgi website provides a graphical description of a dungeon expedition. It also displays hints (the green arrows), possible locations of the treasure based upon those hints (the white question marks), boss-monster locations (the monster), and boss-monster warnings (the yellow triangle). 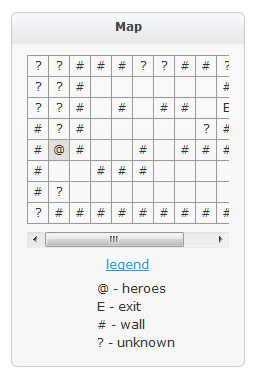 Hovering a mouse cursor above a blank square will display the diary entry for that particular square. Most importantly, Gods can attempt to match their current map with an existing map to obtain a full picture of the dungeon. For more information on the Godville Dungeon Maps site, go to the forum thread Dungeons: have you been to the Godville underground yet? or Godalert.info. The treasure is generally found around 5-6 rooms diagonally from the entrance, in the quadrant indicated by the treasure hints. Dungeon layout permitting, search around this area, but don’t get fixated as it could be 3 up and 9 over, or 5 down and 7 over. The treasury is never in the 5 columns or rows centred on the entrance. If the treasure is in the NW quad, it will be at least 3 rows north of the row the entrance is in, and at least 3 columns west. ↑ Example chronicle entry: "Not knowing what they are doing, the heroes move to the west. The heroes are standing next to the exit, but their sense of heroic honor and dignity won't let them to leave the dungeon before traveling 20 steps. A fresh breeze blows from the east." ↑ Example chronicle entry: "Powerful magnets draw the heroes to the east. After stumbling onto an abandoned sanctuary, the heroes unrolled single-use prayer rugs neatly stacked nearby and sent rays of goodness to their gods. Visible pathways lead to the west, east and north." This page was last edited on 22 March 2019, at 00:50.